Compared with the skyscrapers in downtown Oakland, the Cathedral of Christ the Light is modest in height. Ephemeral and reflective of every passing cloud, its seeming lack of structural solidity is startling. Unlike many ecclesiastical fortresses, this cathedral exudes a sense of permeability, appearing to allow in as much as it keeps out. Since its dedication in 2008, it has been compared to a nest, a tent, a basket and other forms that are rooted in the natural world and vulnerable to its forces. The architect Craig Hartman of Skidmore, Owings & Merrill, L.L.P., a firm known for large commercial structures, intended to design an inspiring space made from light and humble materials. In all important ways, he has succeeded. This cathedral is “not meant to impress through its consumption of resources and display of spectacle, but to achieve a generosity of spirit with modest means,” Hartman said. He emphasized wood, concrete and glass, three materials used since antiquity. Rendered to reveal their essence and intrinsic beauty, they cause us to reconsider in the face of stressed natural resources what is truly precious and rare. If church builders once expressed reverence by using the costliest materials, then Oakland’s cathedral offers prescient commentary on how luxury will soon be defined. Structurally too the cathedral touches the earth lightly. Its concrete base floats on a series of isolators to protect the building from seismic damage. A louvered wooden structure rises above the base, cupping the sanctuary and revealing snippet views of the sky. Its unusual elliptical plan was inspired by a variety of influences, from the ancient Christian symbol of the fish to the torqued sculptures of Richard Serra. 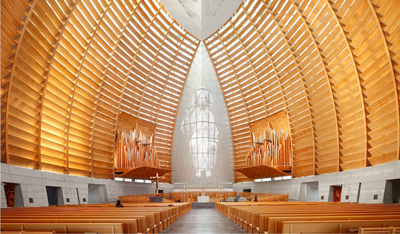 The open-weave structure reflects the diocese’s desire to create a “kinetic worship” experience that draws people into the vibrant space to receive Christ’s light and sends them into the world to share that light. Yet for all its porosity, the building has been constructed to last 300 years or more. Much like a basket, the cathedral’s structure and many of its furnishings are woven, evoking scriptural imagery, from Moses’ infant journey to the miraculous leftovers collected after Jesus fed the multitudes. Its form also recalls the exemplary baskets made by the Pomo and other Californian tribes and those carried by agricultural workers who have powered the state’s economy. The reredos and confessionals, made of latticed wood, encourage openness between clergy and laity and underscore the cooperative nature of worship. The exterior glass panels that protect the internal wooden structure are patterned with vertical lines that visually intermingle with the horizontal mullions. Along the top of the cathedral, aluminum extensions reach upward, looking much like the warp ends of a basket before the weaver’s work is finished, reminding us that our lives are not completed here on earth. The weaving motif continues in an outdoor memorial garden, which consists of a circular boulder that has been broken into pieces and placed, almost, back together. A plaque states that the memorial is “dedicated to those innocents sexually abused by members of the clergy. We remember, and we affirm: never again.” Oakland is the first cathedral in the nation to acknowledge these victims with a permanent memorial. The sanctuary centers on a massive image of Christ. The designer Lonny Israel ingeniously recreated the 12th-century carving of Christ in Majesty on Chartres Cathedral’s western facade by pixelating a photograph of the sculpture. The image was laser-cut into aluminum panels using 94,000 variously sized perforations, calibrated to recreate the Christ figure when light passes through them. In contrast, the Stations of the Cross were made to human scale and placed at chest height to encourage people to touch them. A Gothic cathedral’s darkness was cut by light emanating from stained-glass windows, an allusion to humanity’s stumbling toward salvation amid ever-present temptation and grace. We, who can instantly access as much human misery as we can bear, know darkness well. Perhaps it is light we need most now. This cathedral invites light in—dappled, raking, translucent, reflected, soft, sharp and changing. Even the Christ in Majesty is made of light, formed of thousands of voids through which light streams in. Those same holes, molecular wounds, suggest that we stand on Calvary too, spears in hand, just as the soldiers who pierced Christ’s physical body once did. Yet in the face of these daily choices, there is grace, conceived in Oakland’s cathedral as light that pours in, surrounding us. View a slideshow of photographs from the Cathedral of Christ the Light. We cannot underestimate the power of Beauty to transform. I work one block from this magnificent cathedral and pass by it every day on my way to work. In fact, I watched its construction. This cathedral is nothing short of stunning. At first, I had no idea it was a Catholic Church and was pleasantly surprised to discover it was. Not being Catholic, but Christian, I shyly entered one day and was deeply touched by the unusual interior, even transfixed. So impressed was I that I brought my non-Catholic parents to visit this Cathedral of Christ the Light and they too were astonished by its beauty. I am now seriously considering coming into the Catholic Church and I daresay this beautiful cathedral played a part in drawing me near. Wow! Transforming indeed! Blessings to you Sherry, along your faith journey. You have been touched by the Sacred in that space. I hope you find a vibrant RCIA community to start your inquiry. I'll have to make time for a visit to this special place next time I'm in the Bay Area. Thanks for your remarks! Yes , as one approaches the cathedral there is a feeling of a boat making its way through the world of here and now . The doors and their handles are beautiful . The placement of the Baptismal pool somewhat to the " Gospel side " so that you re- orient yourself to get to the main aisle towards the altar are evocative of the journey to God . The medium is the message . In stone , at Chartres , above the doorway , maybe five feet tall and perceived from below by those who enter is one thing . But as rendered here it is nothing but grotesque . Jesus seems about to be propelled from his perch on a tiny seat . The only warmth is from the wood and there is so much concrete and no color at all that my impression is cold , cold , cold . It is the antithesis of the Second Vatican Council expressed as edifice . We were told it would be paid for by donors . A few years later we were approached with , " Wouldn't you people like to donate to pay for the new cathedral ?" This during a severe economic crisis and when we were giving extra to our parishes to shore up our failing infrastructure . Add to this the impression that our diocese is only a stepping stone for climbing the ecclesiastical ladder ... Vigneron back to Detroit and now Cordileone to San Francisco ... The last bishop to remain faithful to us was John Cummins . I know , the pope makes them offers they can't refuse ??? To the best of my knowledge the Memorial Garden was not the idea of the diocese . The survivors spoke up and asked for it . Correct me if I'm wrong . The altar is surrounded by seats reserved for Clergy only , even when there is just one Presider at the Eucharist . If a very small number of people have gathered they must remain below and at some distance from the sanctuary . I am not at all pining for statuary etc. That is not what I find lacking . I have no doubt God will use this building made with human hands to give us something to ponder , even stuff we'd rather not think about . I wish Sherry all the best that Catholicism has to offer . This article also appeared in print, under the headline "Woven from Light," in the September 10, 2012 issue. Judith Dupré is the author of Churches and other books on architecture.